The challenge of recreating someone else's dreams so that you actually feel - so that you truly believe that you're inside that person's head - is certainly a daunting one. For nearly as long as graphic adventures themselves have existed, there has been the almost obligatory dream sequence. 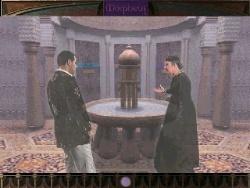 In most games, however, these sequences consist of non-interactive cut scenes used merely as eye candy. But how about interactive dreams? Ones where you have to put yourself in the dreamer's shoes and think like they would in order to return to the waking world? The alternative is to dream that same dream, over and over... forever. As you'll soon discover, the guests and crew of the Herculania are not large in number. They share a common bond... and a peculiar fate. The ship, seemingly decades ahead of its time with the advanced and wonderous technology it carries, harbours a dark secret which only you can uncover. And you'll be left wishing you hadn't. On to more earthly matters. 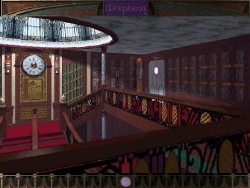 The engine used in Morpheus is quite similar to that used in Zork Nemesis, though obviously more up-to-date and a little fancier. You can pan around a full 360 degrees, but can only move to certain nodes. My machine is well above the minimum speed required to run this game, so I could pretty much turn in real time. As you turn, the cursor will change from neutral into an arrow when you hit upon a direction that you're allowed to move in. When you are able to take a closer look at an object, the cursor automatically turns into a magnifying glass. No extra clicking required, a nice simple interface - though, it still has you scanning the screen for hot spots every time you enter a new locale. But there are no miniscule spots to find, so Morpheus could never be accused of making you 'pixel hunt'. You have the option of transitioning smoothly to all new locations via QuickTime, and I left this feature turned on as the effect was rather nice. But you can turn it off to move around more quickly. Those with little patience might find this necessary, as there are no short cuts to locations you have previously visited. Events of the past are also played back to you via QuickTime movies which are superimposed on the background. These are a little bit grainy, but I believe that is the intended effect. You trigger these movies when you walk into certain areas or examine special objects, and for the most part, you can easily re-trigger them repeatedly in case you missed something on the first viewing. Some of them contain vital clues for progressing the game. The standard of acting is quite good - it certainly never ruined the feeling of being immersed in this game - whereas bad acting hauls you back into reality like a slap in the face. Each locale or... entity (yes, that's the word!) in Morpheus has it's own unique accompanying music. Haunting melodies for the most part, of course. They add immensely to the atmosphere. Sound effects are as you might expect for a modern adventure. Superb. I hope you were paying attention in algebra class. One particular mathematical puzzle in Morpheus had me scratching my head for hours. I knew all the information needed was there right in front of me, but I just couldn't put all the pieces together. Finally, when the solution came to me, I was absolutely delighted with the fruits of my endeavours. I was shouting "Yes, YES, YESSS!!!". It's been years since solving a puzzle gave me such a feeling of accomplishment. 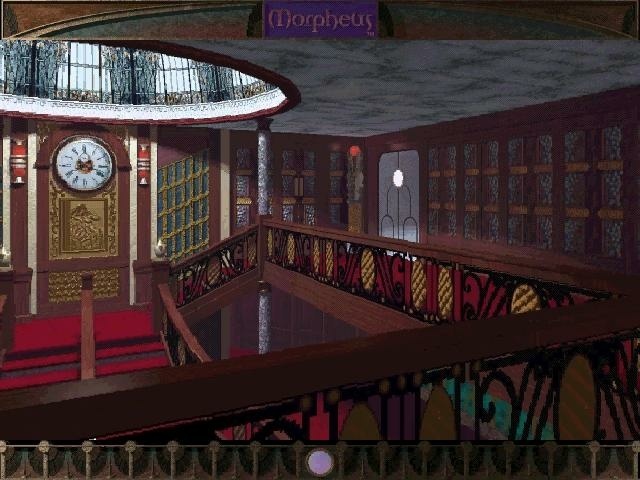 You'll be delighted to know that although Morpheus stretches your mind a bit on the numerical front - that refreshingly, for once, there are: no mazes, no slider puzzles, no sound puzzles(! ), and no timed sequences. As with all adventure games, not every puzzle is a winner. Morpheus too has it's share of clunkers. Even some of the dream sequences are much better than others by a long shot. But the good puzzles are really good, and even the 'bad' ones aren't so bad. Without giving too much away... half the time you're trying to climb inside a person's head to figure out what to do next. You spend the other half trying to climb back out of their head to escape the nightmares! Morpheus is a bit slow to start with, so you have to give it some time to pick up the tempo. The first few puzzles are quite easy, but then, when you finally figure out roughly what you have to accomplish, you'll find yourself saying "Wow, this is really hotting up!" Be prepared to take a lot of notes. The clues are all there... but not necessarily where you expect them to be. At a point near the end, when you think there's still a lot of game left, you quite suddenly find yourself watching the closing credits. A few technical problems, one of which nearly caused me to give up before I even started playing! First off, you have to manually set your screen resolution to 640x480, and your colour depth to High Colour (16-bit) before you play. I would have thought these settings could be re-programmed on the fly. Then, Morpheus can't remember where you put your saved games, so each time you start up, you have to manually point it at the folder you selected when you saved the very first game. Also, each time you start up Morpheus, you must have CD 1 (of 3) in the drive. And finally... I can't believe no one else has ever seen this, and I still got no answer back to my carefully crafted email directed at Piranha tech support. Like I said, it nearly caused me to give up before I even started... after completely re-installing Windows 95 twice (I know. Cheap entertainment, right? ), I finally twigged what the problem was: the Windows default is white backgrounds for all the windows, but this setting causes me to go 'snowblind' (I'm making this tremendous sacrifice right at the moment just to bring you this review). 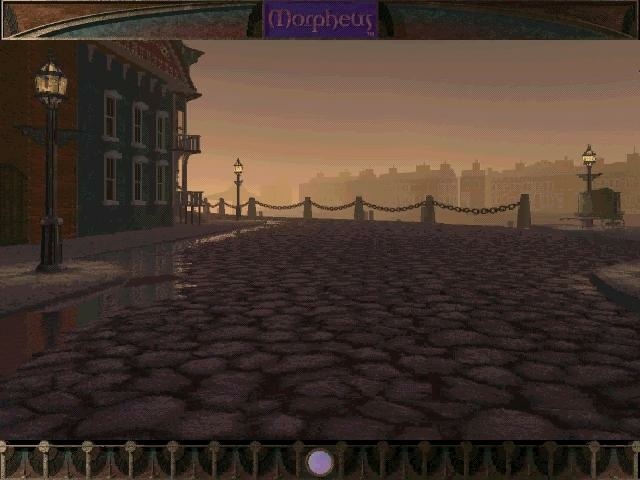 So, first thing I do is set my windows backgrounds to light grey... and Morpheus uses that as its background?! So everyhting looked washed out. A little too dependent on Windows for comfort, guys. Just to confirm this was the problem, I set my Windows colour to red. Wahey! Morpheus through rose-tinted glasses. *Sigh* But in the end, I forgive them, for the gaming experience Morpheus provided was well worth the initial hassle of getting it to run. Copyright © Steve Metzler 1998. All rights reserved. Windows: Pentium, 16MB RAM, Quad speed CD-ROM drive, 640x480 display (256 color or higher) Windows 95, Windows compatible sound card and mouse. Macintosh: PowerMac, 16MB RAM, Quad speed CD-ROM drive, 640x480 display (256 color or higher) System 7.5 or above. The CDs for this game are hybrid CDs. They will work for either Macintosh or Windows 95 computers.